I moved into Tegchen Lekshay Ling this week in order to join in the Nyungne. This is a special meditation practice on Chenrezik, the Bodhisattva of compassion. 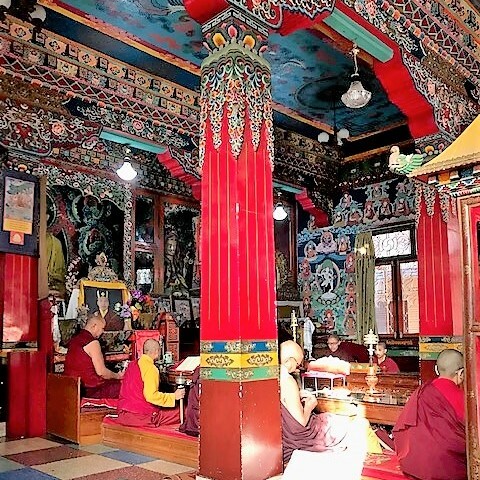 This particular Nyungne practice has been passed down through Karma Thinley Rinpoche’s family, which had a special shrine room especially dedicated to this form of Chenrezik in Nangchen, previously in Eastern Tibet. 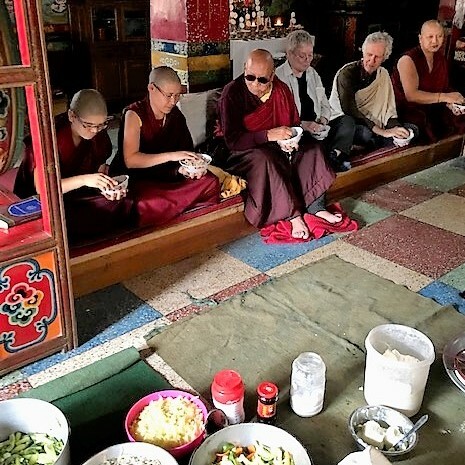 Lama Jampa Thaye received the transmission for this practice and gave it to the Dechen community. Kunga, (Rinpoche’s attendant) came to Manchester a couple of years ago and introduced the practice to us at Kagyu Ling and it is now done there every Easter. 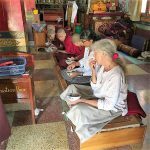 Two of Rinpoche’s Canadian students, Kay and Susan, made the long journey across the globe to join us in doing the practice. 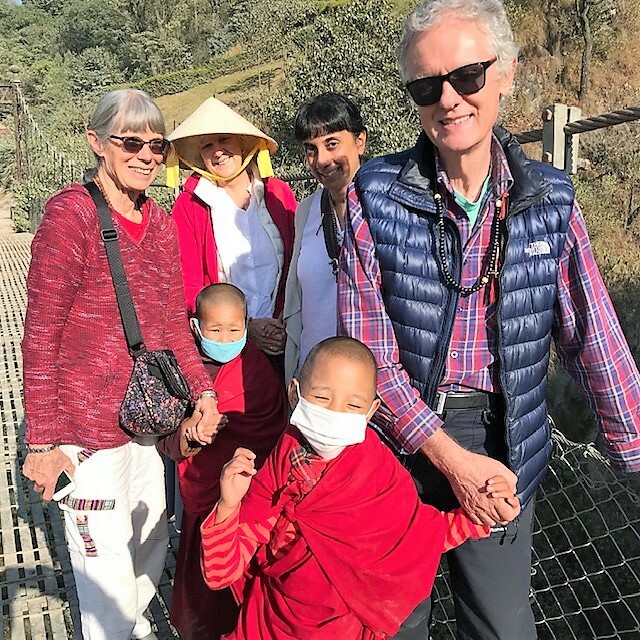 It turned out that Kunga, Susan and Kay had done over a hundred cycles of the practice between them so, along with the monks and nuns, I felt I was with The Pro’s! The practice involves fasting for 42hrs and not drinking on the second day. This begins after a big lunch on the first day which started with a bowl of tsampa (ground barley flour) which we had to mix with tea and butter to form a dough. The monks and nuns are very fond of this and it’s been a staple food in former Tibet. It’s an acquired taste, though, and does tend to sit in the stomach for some time! 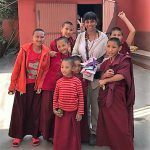 It might sound challenging, but in practice it’s easier than it sounds and meditating on Chenrezik, being the essence of compassion, made it a very beautiful practice. It felt very special to do the Nyungne having received Rinpoche’s blessings. He told us that recently in Nangchen 5000 people did the Nyungne, many of whom stayed in tents, which must have been an incredible feat! Everybody was very helpful and we were well looked after. 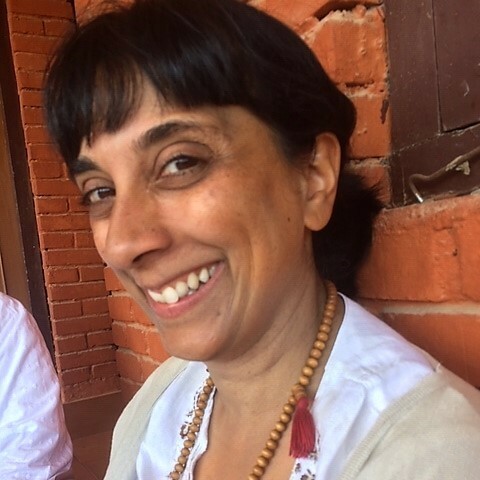 For a few days at least the two worlds of monastic and lay practitioners were almost in synchrony. 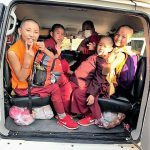 Today there was a trip to Pharping, an area about an hour and a half from Kathmandu where Rinpoche’s retreat facility is situated. 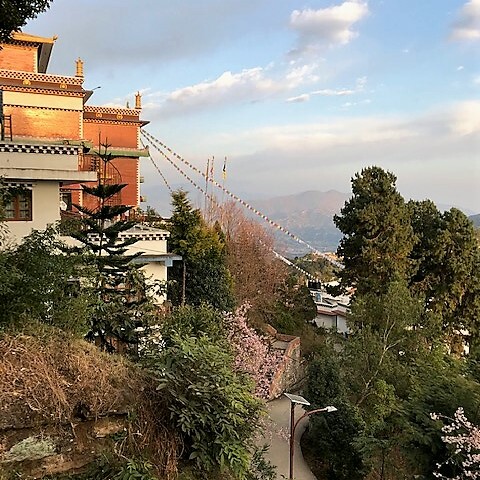 The whole area is sacred to Guru Rinpoche, who meditated there and Vajrayogini, an important deity in Vajrayana Buddhism. Kay and Susan were going to do retreats there so we all set off early in the Jeep with Kunga who ably negotiated the heavily potholed roads and unpredictable oncoming traffic. 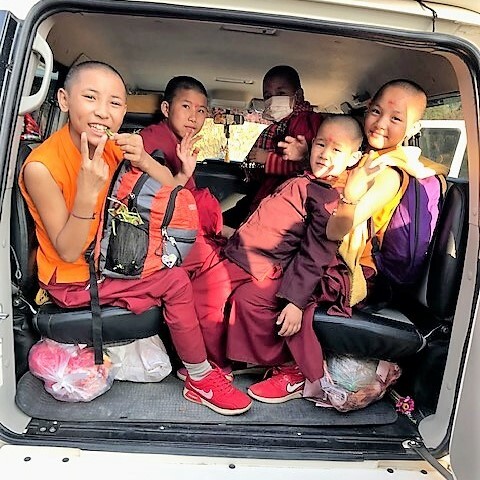 Kirsty and a couple of the youngest ani’s (nuns) who were very excited at the prospect of the trip were accompanying us singing gaily ‘ We’re all going to Pharping…’! As we followed the river along the very bumpy road there was some spectacular scenery with the Himalayas coming clearly into view. 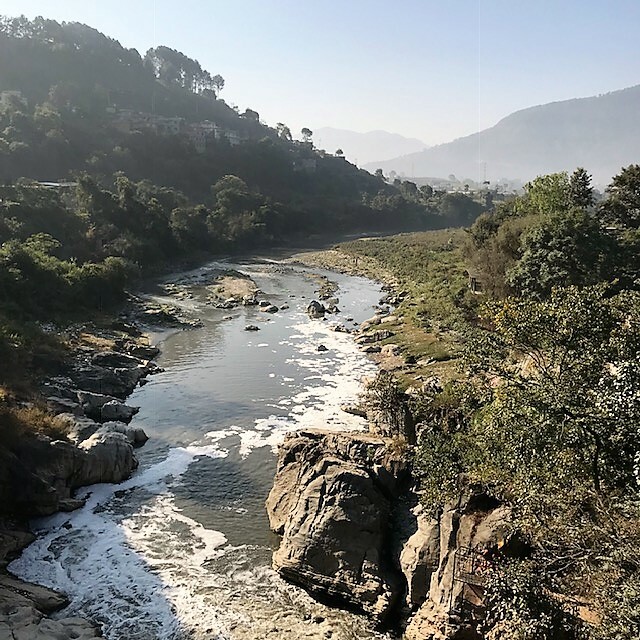 We stopped at a river running through a gorge where Manjushri (bodhisattva of Wisdom), seeing the benefits if the valley was populated, sliced through the gorge with his sword of wisdom, allowing the water to flow out of the Kathmandu lake thereby creating the valley. Interestingly, the iron bridge was built by a Scottish company in Aberdeen and sent to Kathmandu, which seemed like quite a feat. 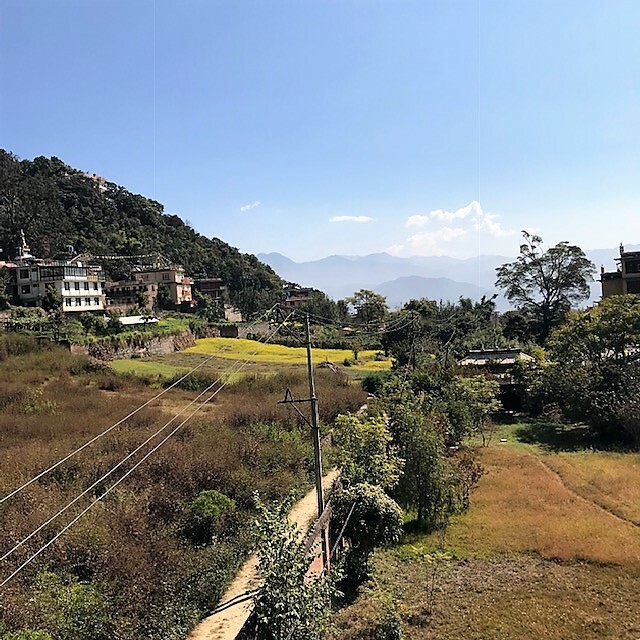 We stopped for tea and French toast at a small cafe which was situated on the open top of a small third floor building, giving us some amazing panoramic mountain views. It was a beautiful day with brilliant sunshine and we could see kites circling in the clear blue sky above. Amazingly, we had the place to ourselves, apart from the couple serving us. After this the next stop was a temple where there is a self arising statue (not made by anyone) of Tara visible in the rock. 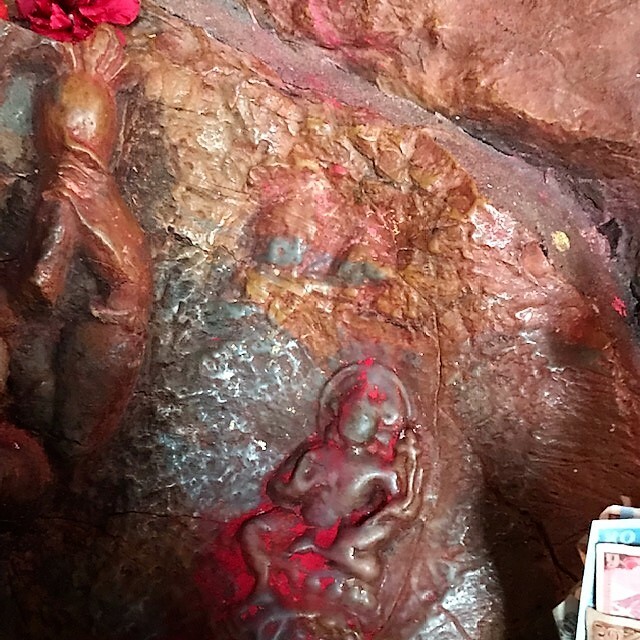 The shrine keeper pointed out an area above it where another statue could be seen starting to form. 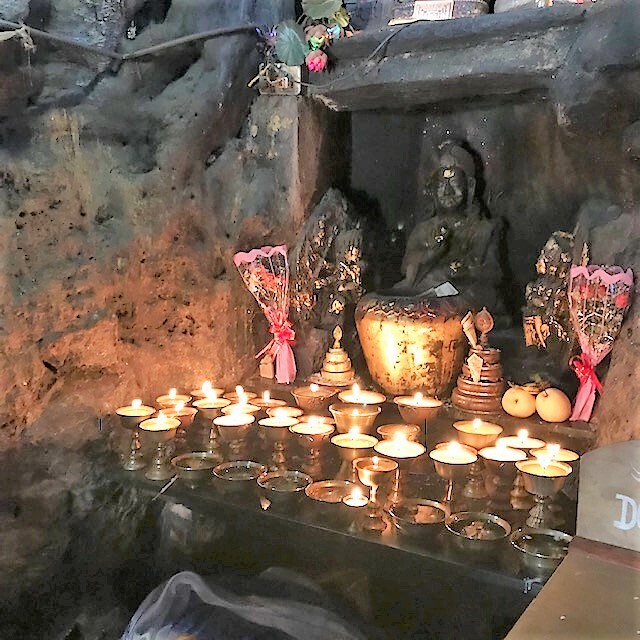 On the way to our destination, we stopped off at Yanglesho cave where Guru Rinpoche was meditating when he received the invitation to go to Tibet. 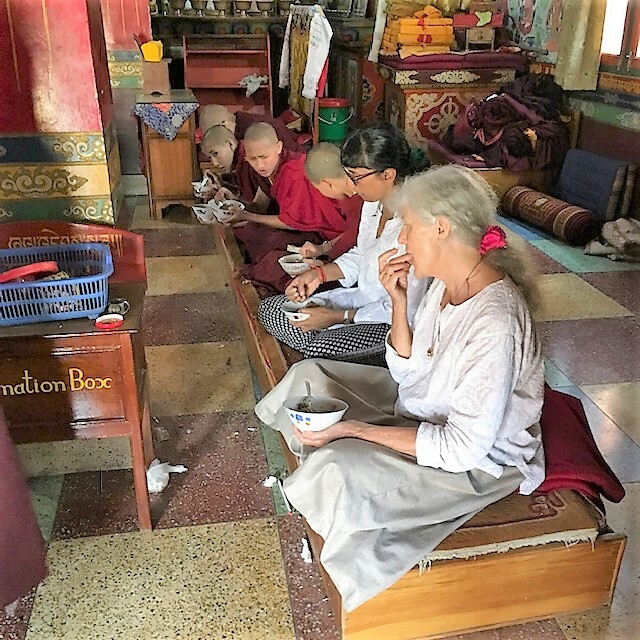 He sent for the Vajrakilaya sadhana (a meditation practise text) from India to enable him to subdue the obstructive local forces in Tibet which were hostile to the dharma (Buddha’s teachings). 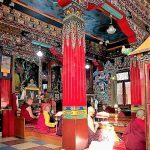 As a result he was able to establish the dharma very firmly in Tibet. We climbed the rocky stairs to reach the cave which was being guarded by a local Hindu. Outside the cave was an imprint of a hand in the rock. Inside the cave was a shrine to Guru Rinpoche and we sat to absorb the blessings of this special place. Soon we arrived at Rinpoche’s retreat facility and were greeted by some of the other younger anis who had come down on the previous day as well as the anis who were living there. It was a beautiful location with views stretching out over the valley to the hills. After helping Kay and Susan get set up in their rooms ready for their retreats we were treated to a delicious lunch which the nuns had prepared for us. 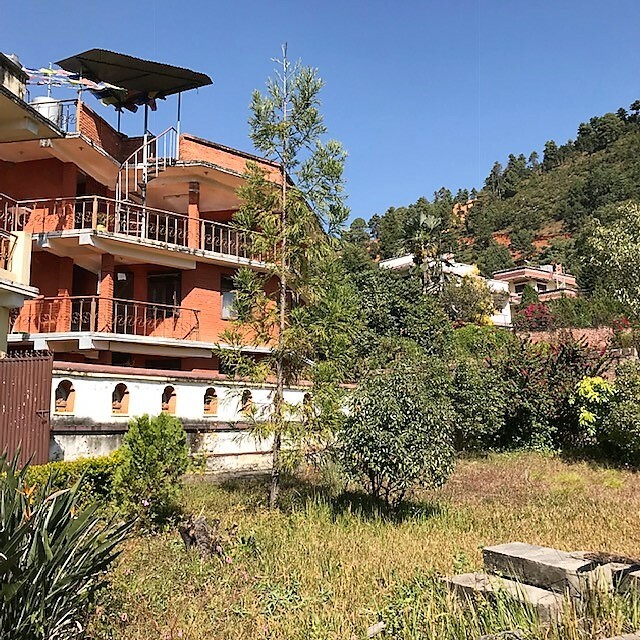 We all sat up on the verandah on the second floor, enjoying the delicious food and wonderful views in the warm sunshine. After lunch we walked up the hill to The Garuda cave where Guru Rinpoche attained enlightenment. It was busy but we were able to sit for a while and absorb the ambience of this amazing place. 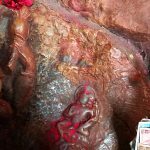 We stopped at the ancient statue of Vajrayogini and were given a red ‘Tika’ powder between our eyebrows as a blessing. We returned to find the nuns had made some delicious soft, fluffy rotis for us to have with tea. All too soon it was time to pile back into the jeep without Kay and Susan but with a few extra anis, for the bumpy return journey back to Kathmandu. It had been a wonderful day. 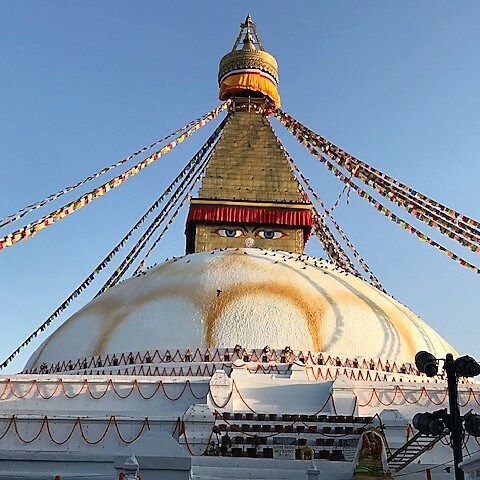 Rinpoche had advised me to visit the three main stupas in the valley before I leave – the Great Stupa at Boudhanath, Swayambunath and the final stupa that I was yet to visit was Namobuddha. 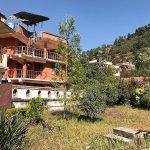 I got a taxi to Dhulikhel and decided to walk to Namobuddha. The directions were to climb the many steps to the Kali temple at the top of a nearby hill and then walk to Namobuddha. There was a sign at the top of the hill so I knew I was on the right track. It was literally over hill and dale, with great views of the hills. There didn’t seem to be anyone else heading that way apart from the occasional Nepali villager but they all nodded and pointed in the general direction I was headed. It was a good three hour walk and I was a bit concerned as I’d set off in the afternoon and knew it would be dark by 6pm. However, I knew this was my last opportunity to see the Stupa and once I’d gone so far there was no gong back so I put my best foot forward and hoped for the best! After a long walk there was a dusty road up a hill which seemed to go on forever. 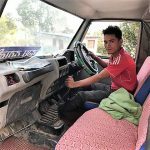 Fortunately, a young Nepali lad in a truck stopped and offered me a lift to the top. It was still quite a way and I realised it probably would have got dark before I got there, had he not stopped. 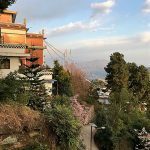 There was a monastery right at the top of the hill and I walked down a little way to find the stupa. This marks the place where Buddha, as a young prince in a previous life, encountered a starving tigress and her cubs. She had given birth a few days previously and, seeing her plight, he offered her his body in a supreme act of generosity and compassion. This resulted in him being reborn in one of the heavenly realms and finding the path to Buddhahood. 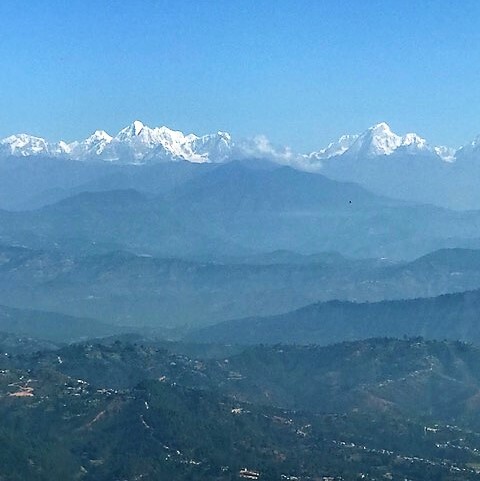 The next day I was able to get another glimpse of the mountains, which the location of Dhulikhel at the edge of the Kathmandu valley, provides on a clear day. 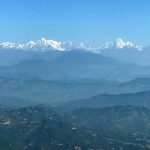 So here I am at the end of my month in Nepal. The passage of time is inexorable and a constant reminder of the impermanence which permeates our lives. It’s definitely been a humbling experience to see how hard people have to work to make a living. 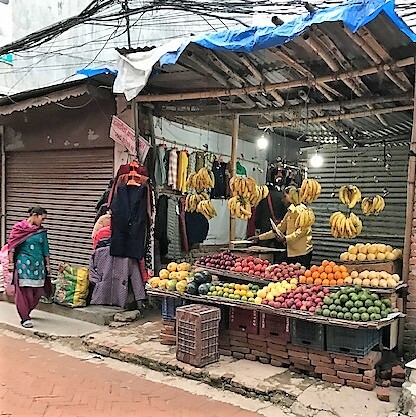 Each day, walking to The Stupa, I’ve passed people setting out stalls of fruit and vegetables, clothing or an endless array of ‘Happy Buddhist Things’. 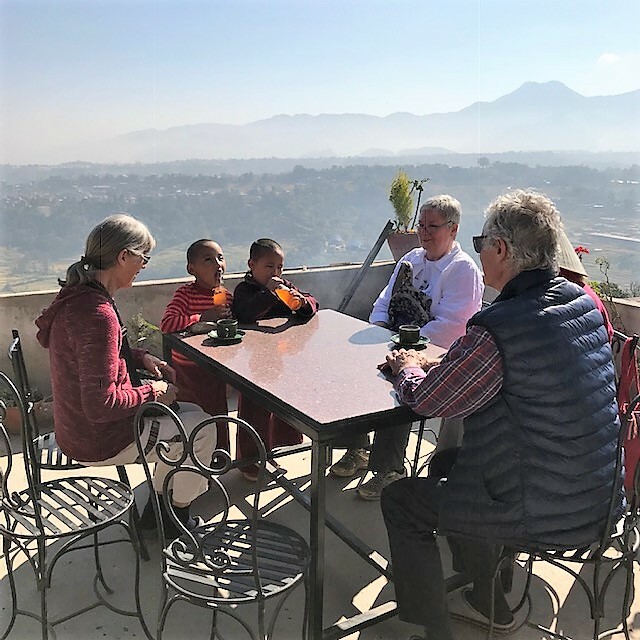 Lives are being rebuilt following the devastating earthquake in 2015 and it’s good to hear how building has progressed since then. 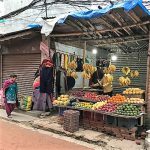 Despite the dusty sometimes muddy roads, frequent sites and smells of refuse on the roadside and lack of material wealth, the spiritual wealth here is immense. 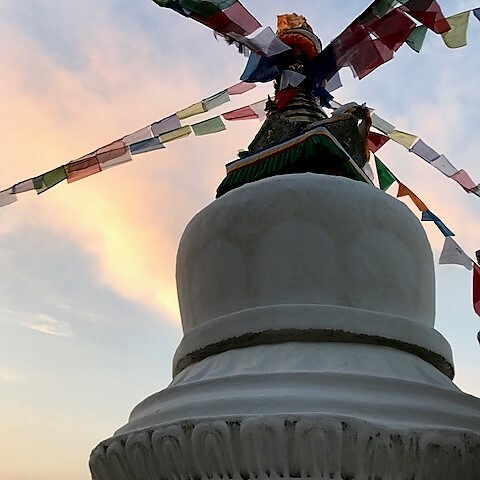 Observing daily life around the Great Stupa and the reverence and faith which is visible here, it’s easy to see the inner source of strength being demonstrated. 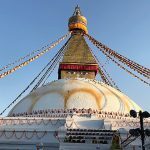 I feel very privileged to have seen some very holy places – indeed Nepal is full of them! 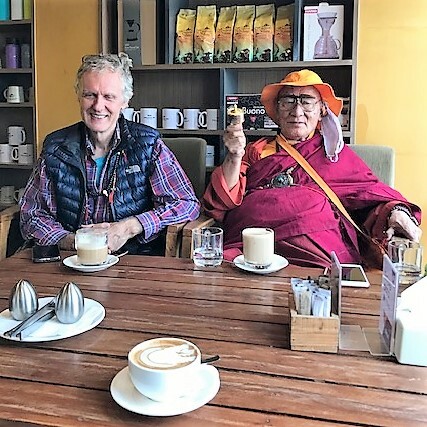 The most precious thing has been being able to spend some time with Rinpoche, who is in good health and often likes going down to The Stupa to do kora and enjoy some refreshments.